IDA has announced the designation of the Danish islands of Møn and Nyord as Scandinavia’s first International Dark Sky Park and International Dark Sky Community. The Dark Sky Park even has Gold Tier status. The IDA designations confirm that Møn and Nyord are one of the world’s best stargazing locations. The designations also recognize the importance of persistent local efforts to avoid light wastage and preserve the dark night skies in this area. Until today there were only 14 Dark Sky communities across the globe and only three of those were in Europe – in mainland Scotland, on the Hebrides Islands, and the British Channel Islands. 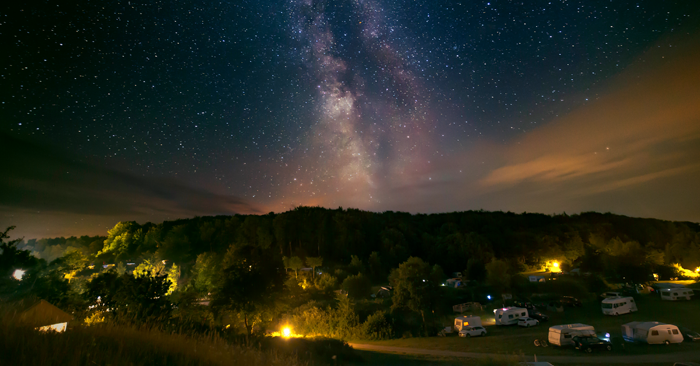 A Dark Sky Community is defined as an community that has exceptional dedication to preservation of the night sky through the implementation and enforcement of a quality outdoor lighting ordinance – and setting an example for other communities to follow. A Dark Sky Park is an area with extraordinarily clear night skies and natural darkness that is a valuable and publicly accessible scientific, natural, educational and cultural resource. There are Dark Sky Parks at 44 locations across the globe, although only nine are in Europe. Møn and Nyord is the first place in the world to simultaneously become both a Dark Sky Community and a Dark Sky Park. The Park area comprises the eastern side of Møn and State-owned parcels of land on Nyord. “We see Møns Klint as our beacon and we believe our potential lies in local values. From Copenhagen, you can see approximately 100 stars. From Møn and Nyord, we can see more than 5,000 stars in our uniquely dark skies. Let’s get out there and enjoy them – they have been ours to enjoy for the past 70 million years. It takes only about 90 minutes to drive to Møn from Copenhagen,” noted Larsen. The Dark Sky certificates will be celebrated at a major event to be held in August 2017. Read more (in Danish) at: www.darksky-moen.dk.